Starting in 1981, volunteers from the PGSCTNE began collecting names and dates from cemeteries in the Northeast, Canada and from their ancestral villages in Poland. They drove from town to town collecting this valuable information and spent many more hours indexing all of it. The cemeteries from Poland in our listings are all in rural areas. Some were overgrown with dense vegetation during our visits and it was not always possible to get to all the headstones. We copied all the gravesites that were accessible. Monuments in many of these cemeteries date only from the late 1800s. In rural areas, wooden crosses and metal plates were commonly used as grave markers, most of which have decayed and rusted with the passage of time. Thus, although these cemeteries are hundreds of years old, most of the surviving monuments are a century old or less. The older monuments that survived were constructed of stone and wrought iron. To date, we have over 125,000 surnames in our index alone. The actual number of individuals we have recorded is in the hundreds of thousands. Although we copy all information on every stone, our index only contains surnames. Each plot in each cemetery is given a specific plot code number. This code number consists of the cemetery code, which designates a cemetery and a plot number, assigned by the society. If you have found a surname of interest with plot number, you can order all of the information found in that plot. CTA is the cemetery code assigned to St. Joseph’s Cemetery in Stratford, Connecticut. 100 is the plot number we have assigned a specific plot which contains information on everyone buried in this plot. Each plot number can contain any amount of names, various surnames and first names. A small number of plots only have a surname, as this was the only information which appeared on the gravestone. LOD is the cemetery code assigned to the cemetery in Myszyniec, Mazowieckie province. Each plot number can contain any amount of names, various surnames and first names. The money we receive will immediately go into our Cemetery Project Fund allowing us to continue this massive project and collect more names and information to help all of us search for our missing ancestors. Czarna Białostocka, Dąbrowa Białostocka, Grodzisk, Poryte, Przytuły, Rożanystok, Majewo, Myszyniec, Stawiski, and Wola Raniżowska. 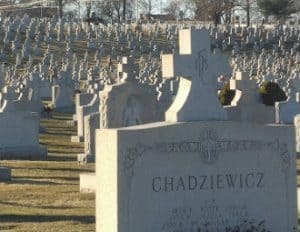 This database includes Polish cemeteries in Connecticut, Massachusetts, New Hampshire, Vermont, Rhode Island, New York, New Jersey, Pennsylvania and several other states outside the Northeast (FL, IL, IN, OH, WI). This database covers Polish cemeteries in Canada, specifically from Quebec province. It includes St. Michele Cemetery and Notre Dame Des Neiges Cemetery in Montreal.